Hugo Aquino is in charge of Transitions’ Foundation Workshop, which makes and modifies wheelchairs for disabled Guatemalans. 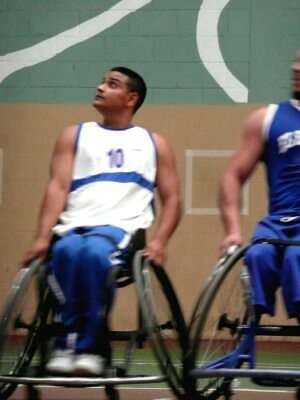 Aquino is also the Captain of Guatemala’s Wheelchair Basketball team and the number one ranked player in the Central American Conference. In this post, MIT student and Transitions intern Paul Lazarescu interviews Aquino. Hugo looks on to one of his teammate's shots during the Guatemala vs. El Salvador match. How did you start working at Transitions Foundation? I started at Transitions in 1997, I think. Alex, Edwin, and I met in the Hermano Pedro Hospital when I was eleven. We met John later – he was a volunteer in the special school. We met John in ’95, and the program started two years later, in ’97. Nothing (laughs). I’m in charge of the workshop, where 12 people work. I’ve been workshop boss since the program began in ’97. I really enjoy it. Out of the 12 people in the shop, two people are not disabled. They can help pick up things from the shelves. Which is your most comfortable wheelchair? I like both my normal wheelchair and my basketball wheelchair. My everyday wheelchair is a [used] Quickie which came in a container from the U.S. Mickey Kay, a previous volunteer who himself plays wheelchair basketball, gave me my basketball chair a year ago. What is the most important thing about a wheelchair for you? For me, it’s comfort. You can sit in the best wheelchairs all day and be relaxed and you won’t hurt your body. It’s also important that my wheelchairs are customized, so all the lengths and widths are perfect for me. Tell me something about playing wheelchair basketball. How do you get around Antigua? I drive everyday in my car. I use my wheelchair in the workshop, and I bring it home on the weekends. As I had polio, I can still do some walking, so I don’t usually ride my wheelchair in the street. What is the route that you take every day? Everyday I drive from the office to the workshop. I use my wheelchair in the workshop to get around. On Fridays we return to the office in the middle of the day. After lunch, I take my basketball wheelchair from the office to the basketball courts, where we practice our wheelchair basketball. Photo of Hugo Aquino and Post by Paul Lazarescu. This project is supported by the MIT Public Service Center.